This newly manufactured 45 Auto ammunition is PERFECT for target practice, range training, or plinking. It is both economical and reliable and is produced by one of the most established ammunition plants in the world. The Tula Cartridge Works was founded in 1880 and is currently one of the largest ammunition manufacturing plants in the world. The Tula name has gained a following worldwide for its rugged, reliable, and economical product. This cartridge complies with CIP requirements and the casing features a polymer-coated steel casing with a non-corrosive Boxer Primer. The projectile features a bimetal jacket (contains steel and copper) and a lead core resulting in excellent ballistics characteristics. You may have noticed in the last few years that Tula Ammunition has been readily available on the market. What you may have not known is that they've actually been around since 1880, and that they are currently one of the largest ammo manufacturers in the world. I was recently able to test some Tula .45 ACP ammo. This was their steel case, 230 grain, full metal jacket load. Something that sets Tula apart from other manufactures is their use of bi-metal jackets. This means they use a combination of both steel and copper. Now, many may wonder if steel in the case or bullet may harm their firearm. Put simply, this combination of metal is soft enough to use any serviceable firearm, and an added benefit is that the jacket holds it's shape very well. Unlike some Eastern European ammunition that you may have encountered in the past, this is non-corrosive and boxer primed. The steel case is not as workable as brass and is not intended to be reloaded. If you're not a reloader, this really doesn't matter to you. And you can shoot more by buying steel at a lower price than brass. I tested this ammunition in two different 1911s. When it comes to .45 ACP, if it works in the 1911, it will probably work in anything. And I didn't have any problems with this Tula ammo. In fact, it shot great. It was very accurate at 10 yards from the stand. It has the same velocity and energy as 230 grain .45 ACP hollow points, so you can practice or train effectively with this ammo. It would also be great for just having fun at the range. Tula's ammunition is not as clean burning as other ammunition I've tried in the past, but this had no effect on reliability in either pistol. 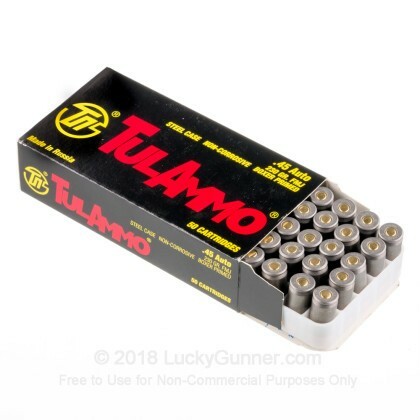 I think this TulAmmo .45 ACP ammo is a great deal, and I wouldn't disregard it just because of the steel case. 500 rounds through a Sig P320 and FNX 45. Great for the range. Not one single mishap. Will buy again. I use this ammo in my Sig Sauer p227. I have had no problems with malfunctions. Ammo works flawless as it should. I would purchase it again. I would recommend to any one who likes to shoot a lot at affordable prices. Great, cheap rounds! No problems here. Shot 300 rounds out of my Springfield xds. No issues with jamming. Great for the range. Very disappointed in Tul Ammo. I thought the gun was going to get ruined after mulitple jams. I went shooting and had real problems with jams for the first time with my 45ACP Sig Sauer. Never had a problem with any of my guns or ammo. I had constant jams and required a gun smith to get the gun to work again. Steel cases are not worth the savings or trouble. I was originally skeptical of buying Tula Ammo, but decided to give it a try based upon the price. I bought 500 rounds and much to my surprise the ammo has performed flawlessly and is very accurate out of an equally inexpensive Hi-Point 45 JHP. 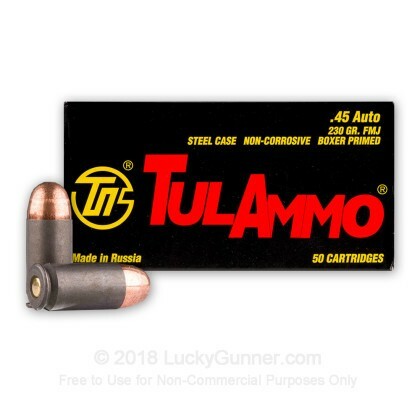 If you want to shoot 45 ACP on a budget and don't mind non re-loadable steel case ammo, I would recommend giving Tula a try. Hope your results are as good as mine. I have two Cowboy action guns, a Uberti and Ruger Flat Top with dual 45 Colt/45 acp cylinders. I often use the shorter acp because they seem to shoot better and are easier to get out of the gun. As far as accuracy it is as good as an factory ammo I can find and the speed is equally to most 230 grain ball ammo. It works fine in my new Governor, my Colt and my Rock Island as well. The only weakness is that in the Governer with that long 410 chamber they lose velocity down to about 750, but otherwise shoot great and just fall out in the provided moon clips. Love this ammo. This product performs quite well. I was definitely surprised with its performance, for always getting such a bad rap! It’s a little more dirty of a round, however it performs well. I had zero FTF or ejection issues. Worth the price !! Been through about 250 rounds not one issue. Function nicely through Springfield 1911 loaded. These bullets punch holes in paper every time. Perfect for my Hi Point JHP 45. No failures, accurate and priced right. Fired 500 rounds of .45 FMJ with a Ruger SR45. Wonderful! Not one failure of any sort (loading or firing). I bought 500 rounds on a recommendation from a friend. It's a little dirty and the powder stinks but for cheap ammo, you can't complain. 100 rounds through my Kimber 1911 so far and no issues with chambering or FTF. For inexpensive practice ammo, this is a great buy. Very happy with the staff and service of Lucky Gunner as well. Just ordered 500 more of a different brand to stock up. Good value, good price. No jams or misfires. No problems with this ammo. In the thousands of rounds I have fired I haver NEVER had a misfire. Plus, ya sure can't beat the price for target ammo. Worked great for the price! They can't be reloaded because they're steel jacket is all. Out of 400 rounds of 45 we shot and the 500 rounds of 9mm we did not have a single jam and used many different pistols great practice ammo for money. Very cheap, which was awesome. If you want consistent target ammo, this isn't it. Usually I'd only seen Tula with the copper fmj projectile, these were all lead. They didn't do much to the barrel of my m&p but were very smokey. I'd really only recommend these for home defense being that there will be less distance for these to travel. More than 30 feet...might be able to hit the barn...who knows. On a lighter note, I will buy again from Lucky Gunner, the service was excellent. And very fast shipping. This was my second order of 1000 rds of tula .45 acp. I have shot several thousand rds of the tula with almost no ftf in all my firearms. (and i have many different calibers) Since i don't reload the steel cased ammo is my choice for practice ammo. LG gets the product out fast and they don't scalp you on the shipping!Good prices good service good products. I've fired 250 of these through my Glock 21 gen3 with no issues whatsoever. Unlike other reviewers on here, this ammo did not seem any more dirty than other (more expensive) ammo. I was actually surprised by how clean my gun was after an hour at the range. Warning for new shooters: since these are steel-cased, steel-core bullets, many ranges may not allow them. Be sure to check your local range rules before bulk ordering these. Being the cheapest round for a 45 that I could find, coupled with overall good reviews, I decided to give it a try with my ruger sr45. Within the first 50 shots I had 5 jams (live round stuck in the chamber). With my Winchester ammo I've only had one jam out of over 10,000 rounds on the same gun. Shot through the Winchester, put back this Tula ammo, and wala, more jams. It's garbage. Don't buy. I'm shooting these in my Springfield XDM .45 compact because this gun is not picky about what you put into it, as long as it is a .45. I have only shot about 100 rounds and only one that didn't fire but when I added it to my next magazine it shot. Because .45 are so expensive I only shoot it once a month. 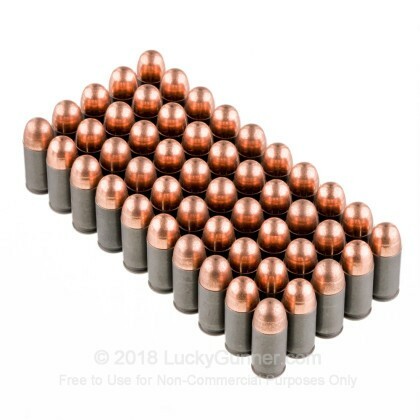 Lucky Gunner is the lowest price I have found for .45, even when you add in the shipping cost. It shot well through my Rock River subcompact. Great practice ammo at a fair price. 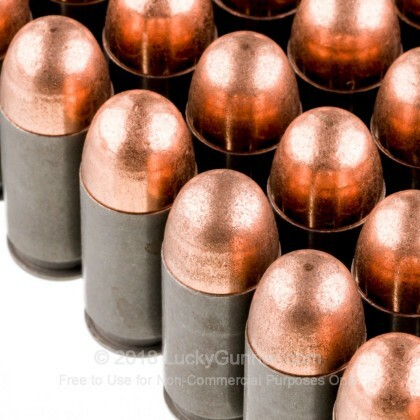 I have used the Tula ammo in .45 acp with not a single problem. Of coarse my Taurus PT 1911 will eat any type of .45 acp ammo that I feed her. The Tula ammo is a good inexpensive round to practice with. I have even carried them for CCW when I was out of my Winchester Ranger-T's. This ammo does not have a full powder charge. Gun will function but at lower than normal velocity. I bought 2000 rounds hoping to replicate G.I. ball ammo, but this plinkerpuff stuff just makes it out of the muzzle, running well under 700 fps from 3 different full size pistols. I will say feed and function is perfect in my guns. It goes bang every time. It is very dirty like everybody else says, dirtier than cast bullet reloads or anything else I ever shot. I could put up with that if they would just put a full powder charge in the case. I guess you get what you pay for after all. I've used this ammo with lucky gunner for awhile now, good fast service and no problems with the ammo in my glocks. Can't beat it for the price going down tange. I was quite surprised to find that all the bullets in my order are a shiny silver color. 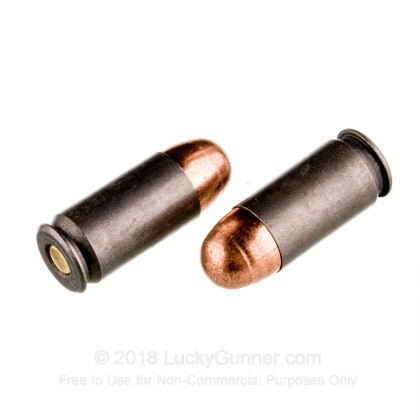 These bullets are normally bi-metal which means they have a copper coating over a steel jacket (as shown in the photos). I think the factory must have forgotten that step with my batch. I haven't tried shooting these yet, but others report using the Tula 'silver bullets' with no ill effects. I plan to use them exclusively for target practice so I don't really mind. I have used Tula in 9mm,. 40 and .45 with FNH, Kahr, Star and pistol caliber carbine. I can count FTF's on one hand with almost 2000 rounds fired. Great value though a bit dirty. I couldn't pass up the value of this product during a weekly promotion. I have gone through the entire 500 round case that I purchased and received 48 hours after the order was placed. Not a single problem was encountered with this ammo. All 500 rounds were fired through a Glock 21SF over the course of several visits to the range. Although it is a dirty round as many other reviewers have also noted, the cost of the case (500 rounds) for use as target ammo offsets the need to perform a 10 minute gun cleaning following a day at the range. I recommend this ammo for all other Glock owners looking for a quality yet cheap target round. This ammo is good range quality ammo at a bargain price. As always, Lucky Gunner never disappoints - Thanks again Lucky Gunner! I used this ammo in my Springfield xdm45 and no problems after 500 rounds. Lucky gunner keep up the specials on this ammo. This was the first time I'd ever bought Russian ammo. I took a chance on it for a new ATI 45 I got for $299 (!). This ammo shot great through that 1911. Ran 100 rounds through pretty hard. No issues whatsoever. Took my M&P 45 out, shot some Lawman, hit the steel every time. The Tula? The rounds were all over the place, and could not hit 8 6 inch steel from 20 yards - fairly rare for me. Got out some paper, and sure enough, it was running wild - high, low, left, right, anywhere but where I was aiming. If I'd not shot it through my M&P, I'd have given it higher marks. I wonder if anyone else has had issues with this amount of inconsistency of accuracy. Ran great out of my brand new Glock gen4 21. Shot 4 boxes the other day with no problems. Good cheap range ammo or anytime you don't want to have to pick up brass. Dirty powder and steel cased but for roughly 1/2 the price I have no complaints. I received my 45 rounds and went to the range, I fired 250 rounds and no problems with my xdm45. For the price you can't beat it for range ammo. I cleaned and inspected the gun with no signs of damaged to the barrel. Nice doing business with lucky gunner, keep the specials going on for this ammo. Avery good value for target practice ,No failures at all. This ammo runs great in my MK 23 and presents well on the target out to 25 yards. I don't have any issues with failure to feed or stove piping. I would use this as primary ammo if SHTF. That's how much I like it. Plan on stocking up at least 2000 rounds. The only thing I found is that it is a little dirtier than others brands. But for the price and performance I don't mind cleaning my gun. Recently shot 200 rounds through my Kimber Pro Carry with no issues of any kind whatsoever. For the price, you can't beat it. I did find it to be a bit more dirtier than other brands I have used, but to me that's no big deal. I will definitely be buying more. I went to the range, put in 200 rounds through my Ultra CDP with no jam or misfires. Heard lots of stories about steel jacket vs brass. Had no problems with my rounds, a bit dirty but I clean my pistol after I fire it so it was fine. Zero misfires ... I will be purchasing more. No issues with 100 rounds thru a XDs. Cleaner than some of the more expensive brands. Had been using Magtech in my ATI 1911 with no problems. Bought a box of Tula and was so pleased with it. I bought as much as my budget would allow. Will be buying more in the near future. This stuff works great in my Rock Island Officers Model. Never had any problems with it. It is a little dirtier than some others, but it is an excellent value. I will be buying more. Great Practice Ammo! Great price. No misfires. Will be my go-to practice ammo. I was looking for less exspessive practice ammo, it seems thats what I got. Great ammo, shot good in my Colt Combat Commander. Looks like a great bargain. Not exactly the caviar of ammunition, but who cares? These rounds discharge so much smoke that each shot obscures the target for about a second on a calm day. At this price, however, I can wait till the wind blows to shoot. They're a little messy used with a Kimber Custom II ACP. Nonetheless, I clean every firearm at the end of day it was fired, so messiness of rounds is not a concern. Some stats for 1000 TulAmmo rounds: 0 misfires, 1 FTE. Great ammo to utilize while providing for students training for their CPL. Have had only 1 jam and I'm guessing it wasn't the ammo's fault. It feeds great in my .45acp Sig 1911 even while bump feeding! Great price, good quality and simply a good value when you're going to the range for practice. Compared to Remington UMC it is really dirty. Accuracy seemed more or less spot on. No failures of any variety 250 rounds in, fired from a S&W 1911SC. great for the money, stock up while you still can..
good ammo will buy again. My Colt rail gun didn't have any problems digesting these, but it eats anything so far. None of the 200 rounds I have put through my Para 1911 have failed to fire or eject, but the accuracy is horrendous compared to other cheap ammo I have shot (S&B, Blazer). Good enough for practice though. I fired 150 rounds of Tulammo in .45 ACP through my Taurus 1911. Out of that I only had two failures to go into battery, and one stove pipe. The failures to go into battery only happened while bump firing the weapon, and the stove pipe happened with no magazine. I think this was a light load. Therefore, it did not cycle the slide all the way back. In all I would say that this ammunition is reliable, and I would definitely buy it again. Bought this ammo for my 1911 worked great, no jams or FTF's no problems at all. I am on my second round of 500 ACP ammo through my Kimber Compact Stainless and it has been pretty flawless. Although one range would not let me shoot it I just won't go back there so not a big loss way too many rules. For target ammo I don't think you can get much better and if you want to stock up for 2012 you won't go broke doing it! Shot well in both of my Kimbers. this ammo is a little cheaper than others. but it doesnt make up for the fact that it jams in my gun. Hi Point 45 acp. ammo that jams drives me nuts lol. my gun will feed any other ammo ive tried, except for this Tula stuff. maybe it feeds well in others guns, but not in my Hi Point. So far great luck with UMC ammo, and its really not that big of a difference in price. I shot 250 through my newest purchased Springfield, and they were nearly flawless. I had one stove-pipe, and one through another .45 that misfired. I re-fed it and it fired, so hey, it worked. Great range ammo from being so cheap. Will probably get more for plinking. bought them for the cheaper cost, but as they say you get what you pay for! cheap ammo, poor quality. I have an HK45 never had any other ammo jam more than these. I clean my HK after each use and never had it jam. it apears to be clean burning powder no fouling as i can see for the price you can't beat it ordered it on saturday had it on thursday great shipping.used in 2 different colt .45 1911 and 1 interarms 1911[marked remington rand] fired 60 rds. out of each functioned well no ftf or ftf. Shooting Russian bullets out of a Turkish Gun... who'da thunk it? This ammo works great. I'd buy more if my wife didn't look at the CC bill! never had any problems,no jams or misfires. my s&w 45 auto eats this stuff up,and for the value ,you cant beat it, excellent for target practice, but i only use holy points for pt. It is a bit dirty and harder to load especially when I get down to 6-8th rounds. But fired well in my sig p220. Shot off 100 rounds in once the jacket failed to clear. Buy for practice but also buy a cleaning kit. fired 2,300 rounds in 5 days at blackwater tactical pistol 1 in sprgfd 1911 - no problems at all. no misfires, no feeding issues. back for more. Good price, Good for plinking, a bit dirty though. Bought for the value. Haven't had any failures to speak of in both Glock 35 or SA 1911. They do shoot quite dirty compared to other name brands, such as WWB. To those complaining about a few FTF or Jambs, I'm sure it is possible. But then again, these were never intended for combat carry purposes. Just plinking. I'd never rely on these in a defensive situation, if at all possible. I'll be back for more. Smoken deal. Best price found, best quantity, best in home defense, the Mac-10 eats it reliably, the Mac-10 is nicknamed "Mickey", give it to Mickey, he'll eat anything: Mickey likes it! out of 100 rounds 5 misfired and the gun jammed several times. I shot another 50 rounds of Winchester and the gun never jammed. I guess you get what you pay for, very difficult loading rounds into the magazine. Had several jams and shot 100 rounds. My HK .45 was clean when I first shot these rounds, not to happy with them. Casings are rough and left my gun very dirty. They are cheap, but you get what you pay for. Ammo that jammed my gun and didn't consistently fire all the time for the first time. Good stuff, only problem I have is the bullets are steal and one range I go to would not allow me to use steal rounds. For the money, this ammo is a pretty good deal. Out of 1000 rounds I've run through my SW 1911, only 1 didn't go bang. Its great target ammo and is as accurate.... well as accurate as I can shoot. It feeds well and hasn't caused any jamming to date. Its true, its dirty ammo and it smokes a lot. You gotta expect that with cheap ammo though. No complaints from this shooter. Great service from LuckyGunner. Good value for the .45 acp ammunition. went bang everytime.Triad it in a pra G.I. expert,XD-9,1947 colt argentine,Taurus pt 92 stainless.Did noy notice any more soot than otyer ammo I've used in the past. I had periodic problems loading this ammo into my magazines. Once it was loaded it shot fine. All the dimensions checked out. At these prices, it's a minor inconvenience. I will buy this ammo again. Can't beat it 4 the price! Just ran a box of .45 ACP through my Taurus PT-145 Millennium Pro with no issues and it was very accurate for target practice. This is a conceal carry subcompact gun with a short barrel and I tried it at a long shot - - - I hit the 50 yard plate off hand on the 1st shot. VERY impressed with this stuff for the price! Load up. I have put 350 rounds through my Glock 36 so far and have had only one problem. The one issue was a failure to fire. If you are looking for cheap ammo to use for target practice, I highly reccomend this ammo. I wouldn't trust it for self defense, but I love it for target practice. I've put a little over 100 rounds of this through my RIA 1911. So far it goes bang every time, is more accurate than I expected. It does smoke a lot. It's also dirty, but that hasn't been a problem yet. I clean my guns and expect fairly sooty residue with "cheap" ammo. Good bang for the buck. Shot close to 500 rounds of tula ammo through my colt combat elite. No malfunctions. Fed well. Ejected well. I keep hearing how dirty this stuff is. It wasn't an issue. Q: Does this ammo have a corrosive powder? A: Hi Phil. Every caliber in the Tulammo Black series uses smokeless, non-corrosive propellant. A: This is a non reloadable steel casing. Q: What is the muzzle velocity of this load? A: Hello Jim, These 230gr. FMJ rounds by Tula in .45 ACP have a muzzle velocity of 853 fps and a muzzle energy of 372 ft.lbs. They make great target rounds for your .45 ACP forearm. Q: what is the shipping method and cost for this product? A: Once added to our online shopping cart, shipping costs may be calculated by entering your zip code on this shopping cart page to calculate shipping. You have the choice between FedEx and UPS ground. Depending on location and shipment date, shipments arrive anywhere between 2 to 5 business days. All orders ship same, or next business day if after 3PM Eastern. You also have the option to upgrade your shipment with a signature requirement and package insurance. These costs will be minimal and displayed next to the checkboxes if you wish to use these features. There are no hidden fees. 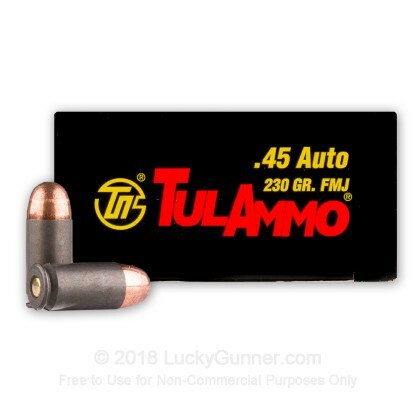 We also have this 45 ACP - 230 Grain FMJ - Tula - 50 Rounds ammo in stock in a smaller quantity.